As consumer electronics get more complicated and technology changes quickly, the need to keep a product up-to-date, especially in home theater applications, has gotten more critical. Instead of facing buying a new component periodically to keep up with the pace of change, engineers have developed a way to keep pace with technology changes by making products that can be updated with new features, without the consumer having to buy a new product. This is done via periodic firmware updates. The concept of firmware has its origins in the PC. In PCs, the firmware is usually a program that is actually embedded in a hardware chip. This provides the chip (sometimes referred to as a controller chip) with specific instructions to control different aspects of the PC, without the danger of being altered by other software changes. In other words, firmware is classified as existing in the realm of true hardware and true software. With many electronics products now incorporating similar controller chips that are used in PCs, the concept of firmware has transferred over to products, such as, Blu-ray disc players, video projectors, DVD players, and home theater receivers. The application of firmware in such products provides a basic operating system platform that allows the execution of complex instructions that enable the component to operate. In addition, the nature of firmware allows the user to update the operating system when new sets of instructions are required to enable new features or access current features more efficiently. Control or determine audio decoding capabilities. Correct or control HDMI or DVI connectivity issues. Correct or control video processing features. Add or remove Menu and Setup Features. In the case of Blu-ray, add or change BD-Java capability or address DRM (Digital Rights Management issues). To correct operating deficiencies due to premature product release. In other words, in order to stay ahead competitors, a product (such as a Blu-ray Disc player) might be released to consumers without being completely ready for real-world use. As a result, a series of firmware updates may be needed to make the unit work as advertised. To add, or update, internet streaming applications, and content services on compatible components (TV, Blu-ray Disc Player, network media player, media streamer). Other functions as designated by the manufacturer -- for example, in a home theater receiver, the addition of a new surround sound decoding or processing format. Downloaded and installed by the user directly from the internet to the device. In order to install a firmware update in this fashion, the device (usually most Blu-ray disc players, network media player/extender, Smart TV, or network capable home theater receiver) is able to access and download the needed update directly from a special website file created by the product manufacturer. This is the easiest option, as all the user has to do is go to the correct site and get access to the download. Installation after a download is automatic. In the case of DVD or Blu-ray disc players, the user may also download the firmware update from a special website or page to a PC, extract the files and then burn a CD, DVD, or USB flash drive (whichever the user is instructed to do). The user then takes the CD, DVD, or USB flash drive, inserts it into the player, and installs the update. The one downside of this aspect of firmware updating is that the CD or DVD must be burned in a specific manner, designated by the manufacturer, or else errors can occur, which may result in a service call. TVs that provide USB ports may also be able to be firmware updated via the download to flash drive method. With DVD or Blu-ray disc players, the user may be able to order the update disc from the manufacturer directly and have it mailed. The only downside with this method is that you may have to wait for a period of time (usually a week) before the firmware update is delivered to you. Ship the component to the manufacturer and have them do the firmware update for you. This is the least desirable option, especially if the user has to pay shipping costs both ways. However, in some cases, this may be what the manufacturer requires. This is very rarely the case with Blu-ray or DVD players, but it may be the case with some other components such as home theater receivers and televisions. Sometimes the manufacturer can send someone out to do the firmware upgrade at your location, especially for a television. As with any technological advance, there is an upside and a downside. As you would expect, the need for firmware updating has its pros and cons. On the positive side, firmware updates can ensure that the product you buy now can still make up-to-date for years-to-come with regards to compatibility when new features or connection requirements become available. This helps to delay the need to purchase a replacement product as often. On the negative side of the firmware update issue is the fact that the consumer has to have some understanding of how his/her components work and interact with other, and also what some of the "tech" jargon actually means. In addition, the consumer is required, in most cases, to know when they might need a firmware update. For instance, if you buy a Blu-ray disc title and it doesn't play in your player, is it a defective disc, or is it the lack of the proper firmware installed in the player? The user then needs to be able to know how to access the current firmware information on their device and has to go on the internet and search out whether a firmware update is needed and where to get it. This is not as much of an issue for many tech-savvy consumers. However, for average consumers, they just want their disc to play right the first time, and not hassle anything else. Going through all the firmware update business is just an impediment to enjoying their movie or other entertainment. 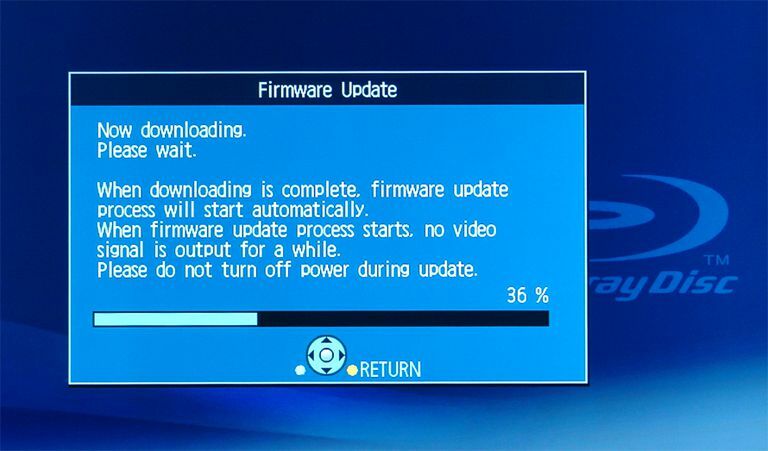 In the vast majority of cases, firmware updates are provided free via the manufacturer, but there may rare cases where a specific firmware update may require payment of a fee - this usually reserved when a manufacturer offers a new feature, as opposed to a routine update to fix an operational problem or compatibility issue. Just as everything else that consumers have to cope with these days: HDTV, HDMI, 1080p, 4K, LCD, OLED, etc... It is now apparent that more and more, another water cooler discussion topic at the office will be: "Have you installed the latest firmware version?"